I should've picked another book for a setup that's as dainty as this. 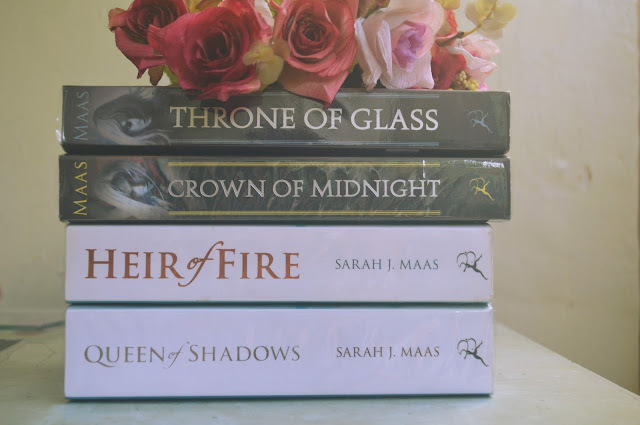 I spent the half of my June doing a marathon of Sarah J. Maas's Throne of Glass series. Yup, I couldn't believe I was able to finish that much content in the course of two and a half weeks. But I did, and I love it when I read that way. I feel productive. Next month, when summer break is done, I'd have to bid goodbye to this kind of productivity to make way for school work. Anyway, I'm so happy for finally knowing why there was so much hype over this series. It's pretty justified. My first impression of Adarlan, the fictional continent where Throne of Glass is taking place, is it's likeness to a fairytale world. And I love it. Besides Western 1800s, another favorite of mine is seeing castles, knights, royalties, fashionable balls and magic in stories like this-- it all has these elements, including badass women characters who could work their ways out even without the men (srsly). This world that Sarah J. Maas created is so unique and intricately done. The setting contributed a big chunk to the great reading experience I had with this series. I would've given up on the series if I wasn't too interested with what came after she became the King's Champion. So despite this annoyance I felt with the first part of the book, I continued to read through it and fell in love with the other characters involved in Celaena's story. 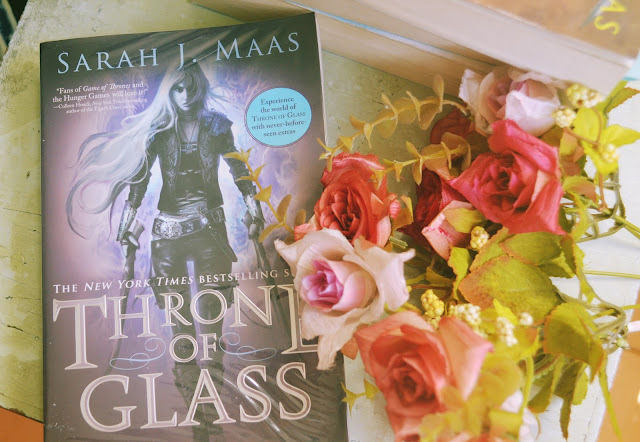 While I was infinitely annoyed with Celaena and Dorian as their constant flirting felt so weird and unnatural in this first book (sorry not sorry), I loved Chaol and Nehemia in this first book. Now let me talk about Chaol Westfall-- the Captain of the Guard who doubles as Dorian's best friend and the other guy who won't admit he likes Celaena because OF DORIAN OMG. I love how sweet and subtle he shows his feelings towards Celaena. I think this is a better way of building romance between two characters instead of how Celaena and Dorian developed-- which was too quick for me. Side note: My sister, who introduced the series to me, ultimately thought I would like Dorian over Chaol because of how romantic Dorian is. I'm on Team Chaol, sorry Team Dorian. This book had its ups and downs. There were two parts to it-- one was that of Celaena discovering about Wyrdmarks and the other part was that of Celaena battling to become the King's Champion. The King's Champion part was what dragged a lot for me because the challenges they faced weren't even that exciting. The thoughts in Celaena's head that showed us what the weekly challenges didn't even get me interested in whatever they were. The encounters she had with the Wyrdmarks instead were more intriguing. It was actually what made me want to dive in Crown of Midnight despite the experience I had with this book. The first book went down with a pretty obvious ending. Midway, I've always known that Celaena would find out who/what was killing the contestants and if she will make it to become the King's Champion. It had a clear question raised at the beginning of the story, that was later answered in the last part of the book. But more questions were raised, and that's the main reason why anyone would want to read more of this series, and eventually know more from Crown of Midnight. See you in my Crown of Midnight review!